Listening to Melvyn Bragg’s series on Radio 4 celebrating the history of Magna Carta, 800 this year, I realise how little I know about the document and the historical background to Shakespeare’s play King John. By the end of 2015 there will be no excuse for any of us to be ignorant about it. 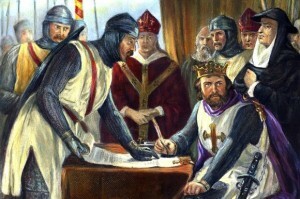 Created in Runnymede on 15 June 1215 Magna Carta is known as the foundation of democracy. Its most important features are outlined on this BBC site. Melvyn Bragg tells the complicated story by examining original documents with the guidance of experts and archivists. I love the way you can hear his excited anticipation as he waits for a copy of Magna Carta to be brought from the vaults of the British Library. Four copies of the 1215 document still exist, two at the BL, one in Salisbury and one in Lincoln, and the document was adapted and reconfirmed a number of times in subsequent years. All the programmes can be downloaded here. Against the Pope, and count his friends my foes”. No wonder Shakespeare ignored Magna Carta. He could not suggest that Queen Elizabeth might be responsible crimes committed by John such as treachery or killing an heir to the throne. The scene quoted above is a great example of Shakespeare’s complete disregard of the facts in favour of telling a good story. Act 3 Scene 1 of King John is historically impossible with Prince Arthur alive (he died around 1203), John being excommunicated (around 1207) and Cardinal Pandulph’s involvement (1211). We’re not seeing many productions of King John in 2015, but the principles of Magna Carta certainly influenced Shakespeare. Over and over again, he shows what happens when the rule of law is ignored. Richard II, for instance, arbitrarily banished his subjects and confiscated their property. But despite this, it’s the unlawful killing of Richard that reverberates through the history plays: Henry IV is wracked by guilt and Henry V tries to make amends before going into battle in France. Magna Carta Trails includes six countrywide trails. The Heart of England trail is from Oxford to Hereford via Evesham, the site of a battle in 1265 where Simon de Montfort, responsible for the first elected parliament, was killed, and Worcester Cathedral where King John was buried. 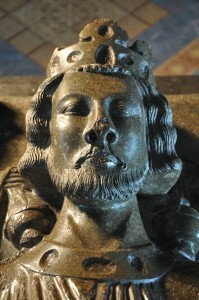 His is the oldest royal effigy in England. For those in the Stratford area, here is a link to Worcestershire events. Parliament in the Making is a year-wide programme of UK-wide events and activities, launching on 20 January which is being called Democracy Day. This will the the 750th anniversary of the parliament introduced by Simon de Montfort. The BBC’s Taking Liberties season has already begun with Bragg’s radio series, but there will be many other events during the year. Over a few days in February all four existing copies of the 1215 document will be brought together in what’s being called a unification, first at the British Library, then at the House of Lords. Later, exhibitions will be held at the BL, Salisbury and Lincoln, as well as other places. 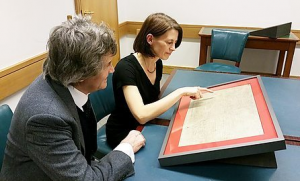 And as a more permanent reminder of the anniversary, in Autumn 2015 the Magna Carta Doctoral Centre for Individual Freedom is to be opened at part of the University of London, Royal Holloway, which is situated two miles from Runnymede where the document was sealed. This entry was posted in Legacy, Plays and Poems and tagged British Library, King John, Lincoln, Magna Carta, Melvyn Bragg, Parliament in the Making, Royal Holloway, Salisbury, Taking Liberties, Worcester Cathedral. Bookmark the permalink.